For those who follow the "Pinks" it will come as no surprise that we are making noises that are both valued and heard in the industry. Over the last year, media attention regularly focuses on panaceaadviser.com when an opinion is required on matters that face the directly regulated adviser today. To see what we have been up to and how we have been mentioned in dispatches click on any story below. 31/10/2018 Money Marketing Will Lloyds and Schroders’ march on the advice market work? 16/10/2017 FT Adviser Has the FCA still not learned its lesson? 11/10/2016 Money Marketing Ian McKenna: Why are providers building standalone adviser software? 26/03/2016 bfcsa BFCSA: UK FOS loathed by advisers in Survey. In Australia FOS loathed by consumers. Its the banks Stupid! 27/01/2016 FT Adviser Who is responsible for the RDR mass-market mess? 30/06/2015 Professional Adviser Vote now: Which of these paraplanners deserves recognition? 09/01/2015 Money Marketing Can advisers rise from the ashes of trail blaze? 08/01/2015 Money marketing Can advisers rise from the ashes of trail blaze? 01/09/2014 Professional Adviser Social media: Are you compliant? 07/08/2014 FT Adviser Why does the regulator fail to prevent failure? 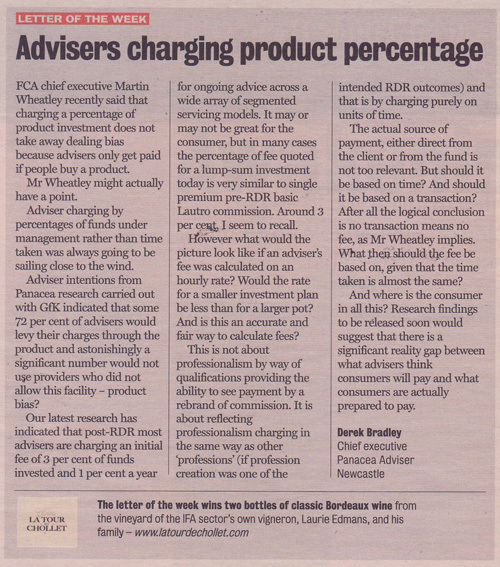 22/07/2014 FT Adviser Are 'virtual' advisers passing on or pocketing savings? 08/04/2014 IFA Magazine Who’s Ready for the End of Trail? 07/02/2014 FT Adviser Consumer rights should have no ‘best before’ date Never too late to complain. 01/10/2013 Bdaily Is 'Mis-Billing' the next scandal? 18/09/2013 FT Adviser Whatever happened to the high-flyers? 05/08/2013 Bdaily Financial services regulation: is it working? 08/07/2013 Bdaily Regulation for regulation’s sake? 18/04/2013 MoneyMarketing Should financial advisers be embracing social media? 24/08/2012 MoneyMarketing Do IFA networks have a future? 17/08/2012 Money Marketing Alan Lakey: Who are the medal winners of the past four years? 21/06/2012 Mortgage Solutions Can MoJ’s clampdown stop adviser harassment from CMCs? 24/05/2012 IFA online.co.uk Independent, restricted – or a third way? 24/05/2012 FT Adviser Independent, restricted – or a third way? 14/05/2012 IFA Magazine Rats and sinking ships? 13/01/2012 Magazine Gay quits. Harsh or Fair comment from Panacea? 27/07/2011 Fund Web Head to head: Should the FSA delay the RDR by 12 months? Click here to view older media coverage.